Successfully Added 720P Mini IP Camera - 1/4 Inch CMOS Sensor, IR Cut, Motion Detection, Android and iOS App, SD Card Recording, Audio to your Shopping Cart. 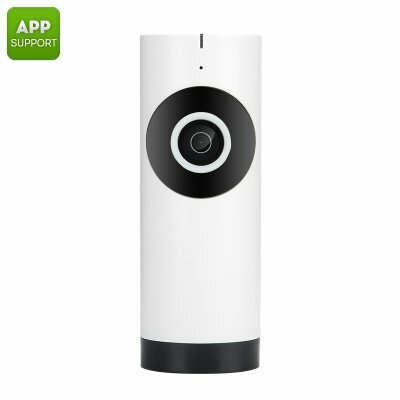 This 720P mini IP cam can be used for your home security, as a nanny cam, as a web cam for Skype calls and more. Coming with 720P resolution and a 1/4 inch CMOS sensor, it will provide you with great quality footage and pictures. Thanks to this IP camera’s small size, it can be absolutely anywhere. It can also be discreet and keep an eye on things when you are not home. With its 720P resolution and a 1/4 inch CMOS sensor, the camera offers quality footage and snapshots and even comes with audio support. The IP cam can record footage onto an SD card and thanks to H.264 compression, will do that without letting the media take up too much storage space. This IP camera comes with motion detection and supports one detection area. Should any activity be noticed there, this event will be recorded to the SD card. With night vision for up to 10 meters, the camera will keep providing you with reliable visual feedback even with the lights off. The 720P security camera is easy to use and install — and you can view the footage live on your smartphone. Simply download the free dedicated app for Android or iOS and see what’s happening at home. The IP cam is great for checking in on pets or the family and with twow ay audio you can even hold a video chat over it. The 720P Mini IP Camera comes with a 12 months warranty, brought to you by the leader in electronic devices as well as wholesale IP cameras..